Writer Tahir Shah explores the square Djemaa el Fna in Marrakech, where storytellers, dancers, boxers, musicians and snake charmers gather and enchant the crowds. Djemaa el Fna may be a common tourist destination for the international hordes who descend on Marrakech but it remains a very sacred and special place for Moroccans. It was also one of the first spaces to be proclaimed a 'Masterpiece of the oral and intangible heritage of humanity' by UNESCO, and one which should be protected. 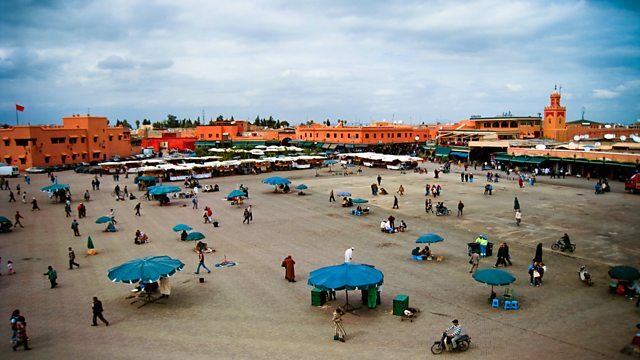 In this "Between the Ears" on Radio 3 the critically acclaimed writer Tahir Shah, who has made Morocco his home for the past six years, explores the square from the inside out in search of its centuries old primal energy. In a meditation drawing together the storytellers, transvestite players, boxers, master musicians, cigarette sellers, snake charmers, medicine men and many more, Shah explores the halkas, or circles, where they gather their crowds to enchant and engage. The sounds of the square tell their own story and as he moves between night and day and circle to circle, he looks for order beneath the apparent chaos; within it he finds an oral tradition and an ancient life force defying the onslaught of mass tourism and globalization.